Robert Zapata, a 2002 graduate of Drexel University with a degree in hotel and restaurant management, returns to his alma mater to start up a new food truck featuring a multicultural menu. Working as a dynamic husband-wife duo, Robert and Nuruk Zapata own Cucina Zapata. 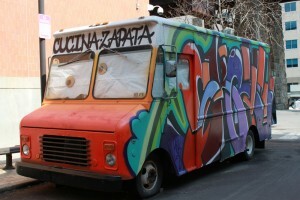 Popularly nicknamed Cucina by Drexel students, the truck will be looking for you — literally. Decorated with two large eyes at the front windshield, the brightly decorated Cucina is found at 31st and Ludlow streets. The Zapatas do their grocery shopping early each morning, picking the freshest ingredients for the orders each day. The meats are marinated each night to ensure the maximum taste for each meal. Even their sauces are handmade and unique to Cucina Zapata. Their house sauce is flawlessly mixed using a mortar and pestle, creating a perfect blend of ingredients including fresh chili and lime. Reaching the truck a little bit before 2 p.m., I realized that I just got caught in one of the busiest times for Cucina. While waiting for my food, I saw around 15 hungry students in line to order. Zapata later told me that it was a slow day, and busy days consisted of lines of 35 students or more that wrapped around the corner. Robert Zapata and his wife, Nuruk, opened Cucina: a food truck with a flare for multi-cultural food. Located on 31st and Ludlow streets, the truck is open Monday through Thursday from noon to 6 p.m. and Friday from noon until 5 p.m. Though the wait may be a bit longer than others, averaging around 10 minutes on a busy day, the food is well worth it. After taking the order, the Zapatas are quick and efficient in cooking the food. Most importantly, the owners created a warm and friendly environment that was very surprising to me. Remembering almost everyone’s names, Zapata made a conscious effort to address each customer by name. He described Cucina as a “community-based” truck that first and foremost works to serve the customers. The menu may seem small, but Robert explains that they “take priority in quality over quantity.” I ordered Short-rib Tacos for $6, which originally seemed a little over my price range. However, I was pleasantly surprised at the plentiful lunch I received. The dish included freshly sliced avocado tossed with tomatoes, cabbage and lettuce. It was mixed with sweet and well-marinated short-rib beef. Finally, it was topped with Cucina’s House Special green sauce and peanuts. The juicy short-rib tacos paired well with the spicy chili-lime sauce, and I could not get enough. I also tried the famous Chicken Katsu, a $5 favorite of many who frequent the truck. Thick slices of juicy chicken are lightly breaded to create a nice and fluffy crisp on the outside. The katsu includes thick slices of juicy chicken that simply melts in your mouth. Lettuce, cabbage and tomatoes are also included with the chicken over a bed of white rice, and an optional sunny-side-up egg can be included for an additional 50 cents. The entire dish is topped with the Cucina-made tonkatsu sauce. I enjoyed all of the individual ingredients of the dish but did not favor the tonkatsu sauce. The tonkatsu sauce had a very tangy flavor, an unwelcome surprise for me. This is, however, the only dish that isn’t spicy that Cucina currently offers. Next time I’ll be sure to try out the popular Sweet Potato Chicken Curry. Although the Zapatas make 40 pounds of it each day, the ever-popular dish is the first to sell out, often within the first hour of opening. Another dish I’m eager to try is the vegetarian burger, which Drexel student David Seok describes as “the creamiest burger that you don’t even realize it’s a veggie burger.” Overall, I definitely enjoyed Cucina. Although my taste buds did not agree with the tonkatsu sauce, I don’t think I will be able to resist the temptation of another short-rib taco. Cucina Zapata is open every Monday through Thursday from noon to 6 p.m. and Fridays from noon to 5 p.m.